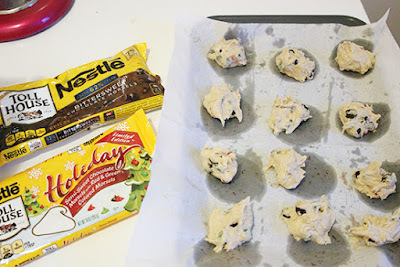 While browsing through Pinterest for baked good gift ideas, I have noticed a lot of the cookies in mason jars have layered dry ingredients that include baking instructions. While these type of mason jars look pretty, the last thing anyone wants is another task during the holidays. 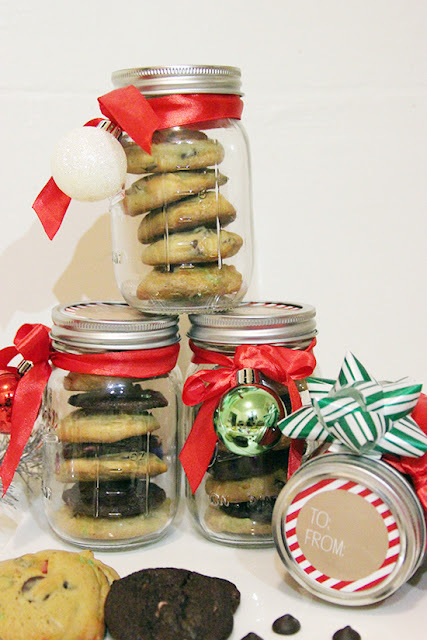 So instead of giving your friends or loved ones a mason jar filled with cookie mix, why not take the extra step and bake cookies for them? 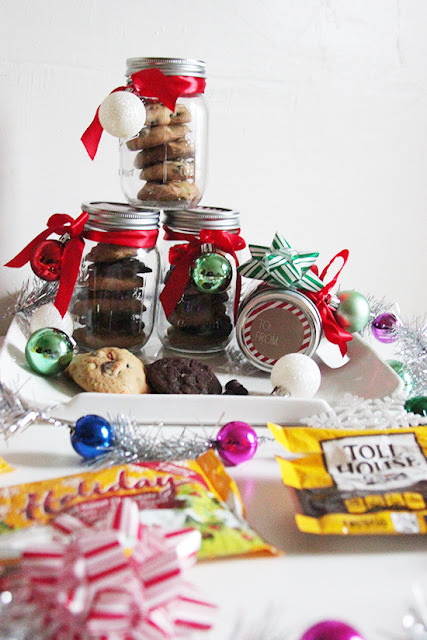 I used NESTLÉ® TOLL HOUSE products to create the two types of holiday cookies inside of my mason jar gift containers. 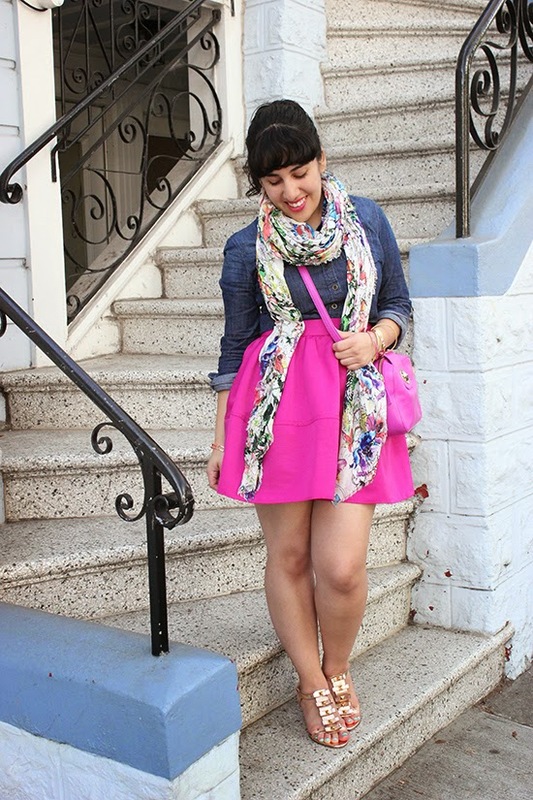 These would make a great gift for a loved one and I am excited to share how I made these! 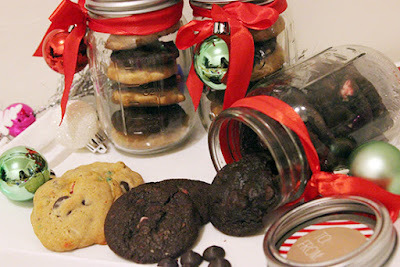 The two cookies in my mason jars included Dark Chocolate Peppermint and Holiday Chocolate Chip. 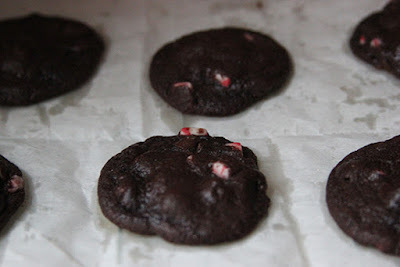 The Dark Chocolate Peppermint cookies are in a precut refrigerated cookie dough and a dozen is ready in less than 30 minutes. I broke out the squares and placed them on the baking sheet after preheating the oven to 350 degrees. I rolled them after spacing the 12 cookies so they wouldn't have a square shape after baking. I liked that the Dark Chocolate Peppermint cookies were really easy to make, but I wanted to bake some of my own chocolate chip cookies using the NESTLÉ® TOLL HOUSE Holidays Morsels. 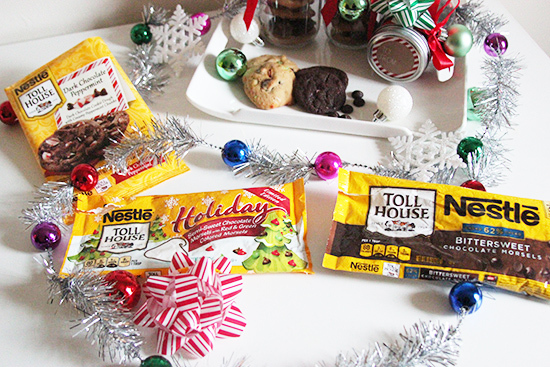 I took the recipe from the back of the Holiday Morsels bag but substituted the nuts with 1 cup of NESTLÉ® TOLL HOUSE Bittersweet Morsels. This felt like the best way to remix a classic for the holidays. 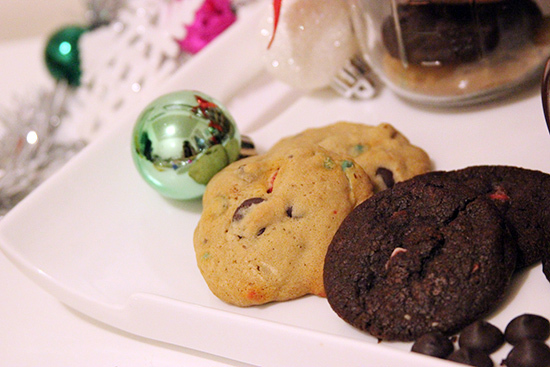 I will admit that I have never baked cookies for my blog because the last time I attempted to bake cookies, it resulted in crispy, burnt mess. I was a little nervous attempting this recipe, but I think I have learned the trick to making soft, chewy cookies. If you learn anything from this post it is that butter should be at room temperature before creamed with sugar to result in soft, cookies. 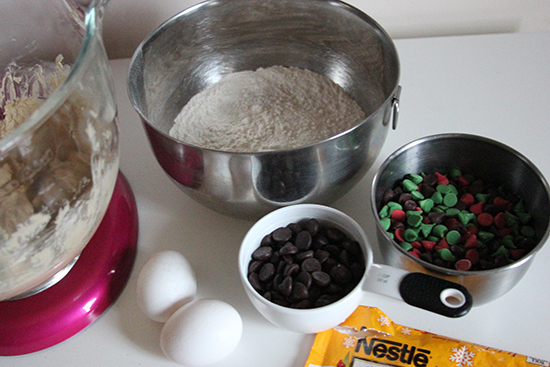 Combine flour, baking soda and salt in small bowl. Beat butter, granulated sugar, brown sugar and vanilla extract until creamy. Add eggs, one at a time, beating well after each addition. 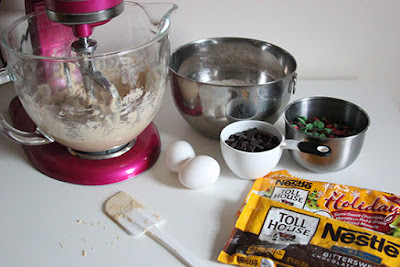 Gradually beat in flour mixture. Stir in 1 cup of each of the morsels. Drop dough with a rounded tablespoon onto ungreased cookie sheets. 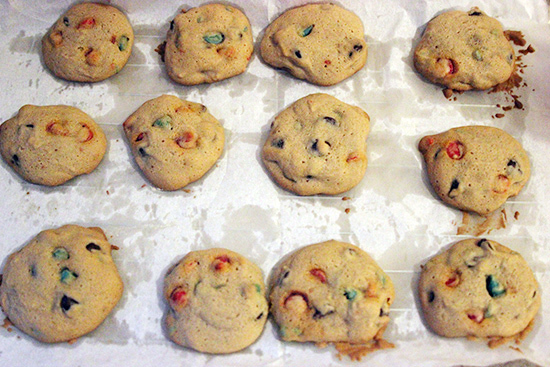 Top dollops with remaining morsels.Bake for 11 to 13 minutes or until golden brown. Cool on cookie sheets on wire racks for 2 minutes and move to wire racks to cool completely. Once the cookies have cooled down, they are ready to be placed inside the mason jars! I found these Spritz mason jars in the holiday section at Target on sale for $2.40 each. They came with the red ribbon and I had holiday ornaments ready to place on them. These came with gift tags on the lids, but one can easily be tied around the jar. I mixed a few of the different cookies together in some and kept them all the same in the rest. 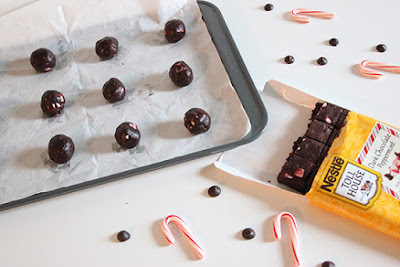 These make a great, inexpensive gift for the holidays and can easily be customized with decorations or items you have on hand. 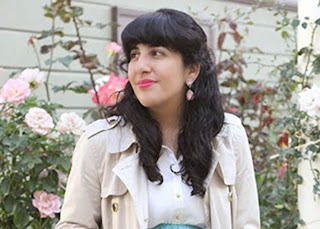 Add a twig from a pine tree, mistletoe, or a fake poinsettia flower to decorate the jar. 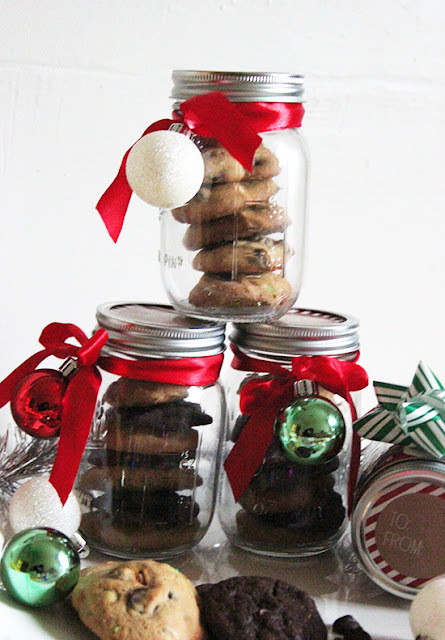 You can always use boxes or Tupperware as your container, but I love that mason jars are budget-friendly and can be used as a glass cup with milk for the cookies. 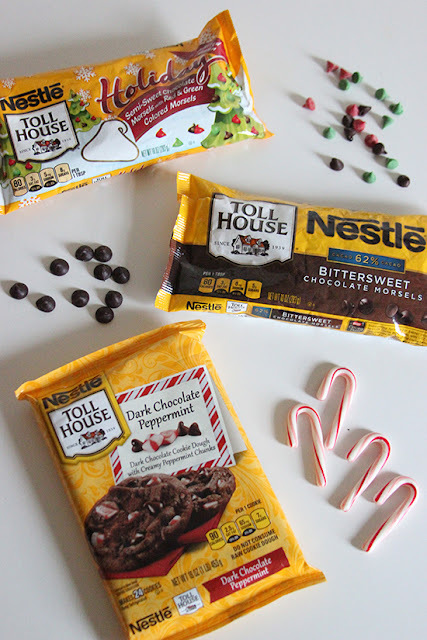 Baking for the holidays is easier with NESTLÉ® TOLL HOUSE and I hope this gives you the inspiration to bake for someone special this holiday season. 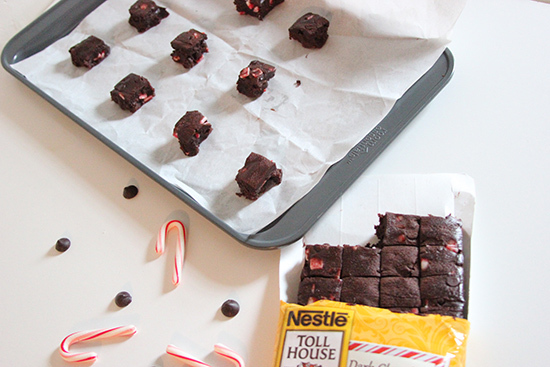 For more baking inspiration, check out their Pinterest page here. To make it easier to bake, I'll be hosting a giveaway on Instagram, so make sure to follow me @willbakeforshoes for a chance to enter and win!